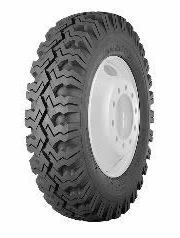 A tire designed for heavy hauling on or off road. Sturdy self cleaning lugs. Extra strong cord body resists snags, cuts, rocks and shocks. Tremendous traction, forward or reverse. Posi-traction tread delivers unbeatable performance in mud or snow. All nylon cord construction provides exceptional strength through "bonus" recaps. Open centre rib with wide grooved shoulder lugs assures unbeatable traction.